The Chrysalis Wind Quintet is part of the renowned Chrysalis Chamber Music Institute at the University of North Carolina School of the Arts. 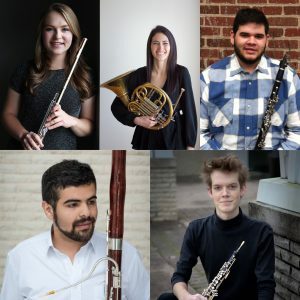 This award-winning quintet is composed of graduate students from UNCSA. In addition to their participation in university masterclasses and performances, they are active in the local community through outreach projects such as the Cross The Line Project. The Chrysalis Wind Quartet is comprised of Emma Bromberg (Flute), Evan LaVack (Oboe), Andres Maldonado (Clarinet), Juan Rodriguez (Bassoon), and Brittany Thomas (Horn). As always Kenan Chapel is honored to host these wonderful young graduate students from our prestigious university at UNCSA. Concert begins at 5 p.m. with a reception following at the Country Club of Landfall. Complimentary tickets will be available at the NE Branch of the New Hanover County Library on April 1st. Please consider a generous donation to help us continue this wonderful music program at Kenan Chapel. See Kenanchapel.com and “Like” us on Facebook for up to date information.